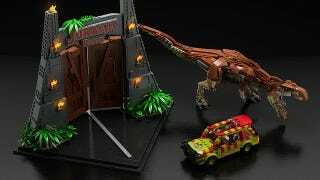 Sami Mustonen has taken this great set and some sound clips from the movie and given us this 33 second promo video for the Jurassic Park theme on Lego Ideas. We'd love to see get supporters for the second time. Seeing as Lego has already picked up the license, it should be fairly easy to get this on shelves. It just needs the 10,000 votes!